Housed in the Chapter Library is a copy of Gilbert Burnet’s masterly work on the Reformation of the Church of England [SGC RBK B.494]. Published between 1679 and 1715, it was for many years the classic account of the changes that had taken place in the church. Burnet was born in Edinburgh in 1643, and became licenced to preach in 1661 at the age of just 18. He soon fell into disfavour with the Bishops of Scotland after questioning their behaviour, staunchly disapproving of their extravagance, pompous lifestyle, and mismanagement of ecclesiastical affairs. Fortunately for him, he had a powerful patron in the Duke of Lauderdale, Charles II’s secretary of state for Scotland. As a result, Burnet was asked to be involved in discussions over religious policy in the face of changing attitudes towards dissenters. Rather than persecuting them, the new policy in Scotland would be one of moderation, allowing the more moderate Presbyterians to practice in their own way providing they were peaceable and loyal. Although ultimately unsuccessful, the attempts to reach accommodation brought Burnet to the attention of the King. Burnet came to England, where he spent the next few years writing, preaching and stirring up trouble for himself. He became very concerned with talk against the Church of England, particularly from those who questioned its legitimacy, claiming that it was purely a political act of state carried out by a corrupt king. Burnet was encouraged to write a response to these smears, and he began to research the history of the Reformation in late 1677. The first volume, of which this is the frontispiece, was published in 1679. Using original sources as his research material, the first attempt at writing a history of the Reformation in this way, Burnet agreed that Henry VIII was a man of many faults, but argued that even cruel princes could be the instruments of God’s will, and that the English Reformation could not have been achieved without a man of Henry’s temper as king. He defended the idea of a national church with the King as the supreme head. The book could not have come at a better time, since in 1678 there had been unveiled a Catholic plot aimed at the assassination of the King, leading to waves of Protestant fever sweeping the country. Although ultimately discredited, it lead to widespread fear and hatred of the Jesuits, and concern over the succession due to the conversion of the King’s heir, his brother James, Duke of York, to Catholicism. On 23 May 1679, a licence was granted for the publication of the first volume, covering the reign of Henry VIII. It was greeted with enthusiasm, and Burnet received the thanks of both Houses of Parliament for its publication, as well as being awarded a doctorate in divinity from the University of Oxford. He was requested to finish the work, which he did in a second volume published in 1680. A third was published in 1715 to correct errors made in the first two. 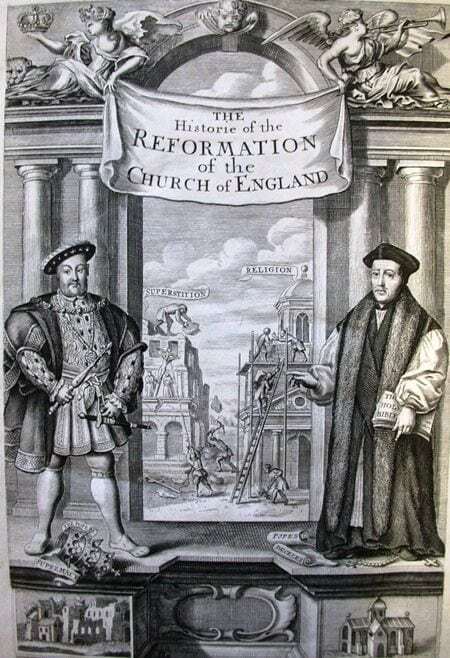 The frontispiece drawn by Robert White shows Henry VIII with Thomas Cranmer, standing over the toppled Papal crown and decrees, and in the background we see workmen tearing down superstition and building up religion. The whole thing was a powerful display of the superiority of the new Church of England over the old Church of Rome. Following its publication, Burnet got caught up in the turmoil over the debated exclusion of James from the line of succession, and was eventually exiled to France, before moving on to Holland. While there, he became political advisor to William of Orange, and a religious advisor to his wife Mary. After their accession to the throne of England, Burnet was made Bishop of Salisbury, at Easter 1689. As Bishop, he continued to advocate tolerance and campaigned vigorously to improve the clergy in the diocese.